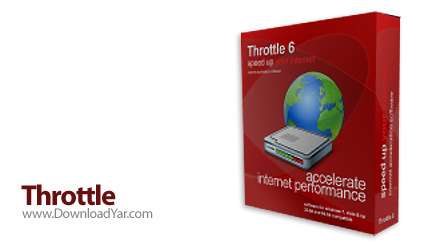 Throttle will help you increase the internet performance. No modifications to your hardware are made and all adjustments and settings are done in an easy to use interface that a child could use. Most 'other' modem enhancers promise that they work while you notice no difference at all in internet speed. Throttle on the other hand has been tried and tested and proven to work. Whether you use a 14.4/28.8/33.6/56k modem, cable modem, or dsl modem, Throttle will boost your internet connection speed. Notice also that Throttle will modify your modem settings to handle those annoying disconnections and hangup's so they happen less often.You no longer have to put up with downloading a huge file and being disconnected in the middle of the transfer. بعد از نصب نرم افزار و قبل از اجراي آن محتويات پوشه Patch را در محل نصب نرم افزار كپي كرده و فايل Patch.exe را اجرا نماييد سپس بر روي دكمه Patch كليك كنيد. برنامه را اجرا كرده و براي فعال سازي برنامه از پوشه Keygen فايل Keygen.exe را اجرا نماييد و از ليست كشويي برنامه ها pgwareThrottle 6 را انتخاب كنيد و سريال توليد شده را براي ريجيستر كردن به برنامه بدهيد.